The Greater Platte River Basin area spans a central part of the Midcontinent and Great Plains from the Rocky Mountains on the west to the Missouri River on the east, and is defined to include drainage areas of the Platte, Niobrara, and Republican Rivers, the Rainwater Basin, and other adjoining areas overlying the northern High Plains aquifer. The Greater Platte River Basin contains abundant surficial deposits that were sensitive to, or are reflective of, the climate under which they formed: deposits from multiple glaciations in the mountain headwaters of the North and South Platte Rivers and from continental ice sheets in eastern Nebraska; fluvial terraces (ranging from Tertiary to Holocene in age) along the rivers and streams; vast areas of eolian sand in the Nebraska Sand Hills and other dune fields (recording multiple episodes of dune activity); thick sequences of windblown silt (loess); and sediment deposited in numerous lakes and wetlands. In addition, the Greater Platte River Basin overlies and contributes surface water to the High Plains aquifer, a nationally important groundwater system that underlies parts of eight states and sustains one of the major agricultural areas of the United States. The area also provides critical nesting habitat for birds such as plovers and terns, and roosting habitat for cranes and other migratory birds that travel through the Central Flyway of North America. This broad area, containing fragile ecosystems that could be further threatened by changes in climate and land use, has been identified by the USGS and the University of Nebraska-Lincoln as a region where intensive collaborative research could lead to a better understanding of climate change and what might be done to adapt to or mitigate its adverse effects to ecosystems and to humans. 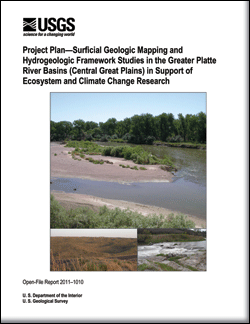 The need for robust data on the geologic framework of ecosystems in the Greater Platte River Basin has been acknowledged in proceedings from the 2008 Climate Change Workshop and in draft reports by researchers developing a multidisciplinary science plan for the Greater Platte River Basin. Berry, M.E., Lundstrom, S.C., Slate, J.L., Muhs, D.R., Sawyer, D.A., and Van Sistine, D.R., 2011, Project plan—Surficial geologic mapping and hydrogeologic framework studies in the Greater Platte River Basins (Central Great Plains) in support of ecosystem and climate change research: U.S. Geological Survey Open-File Report 2011–1010, 34 p.